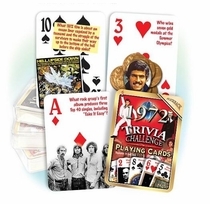 1969 Trivia Playing Cards. First moon landing in 1969! 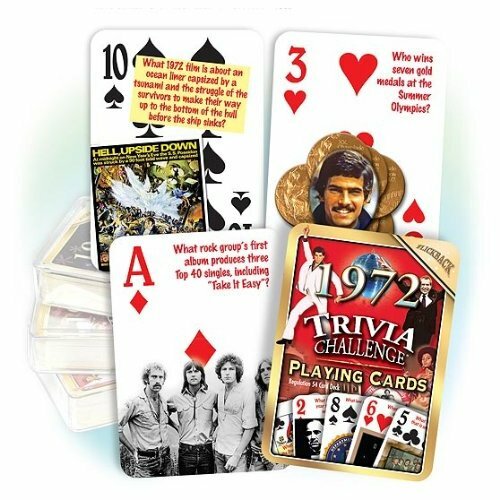 Remember this and other facts as you play cards with these 1969 trivia playing cards. Each of these 50th birthday cards have a 1969 trivia question and matching picture. Answers kept separately. It makes a great 50th Birthday gift or 50th anniversary gift. Here are some sample card questions: Name these two stars of the Academy Award winning film "Midnight Cowboy". (Dustin Hoffman and Jon Voight). Which movie features Peter Fonda and Dennis Hopper as motorcycle mounted drug smugglers? (Easy Rider). Which "miracle" team won baseball's world series? (the New York Mets over the Baltimore Orioles). Which U.S. prison was seized and occupied for 19 months by a group of American Indian protestors? (Alcatraz). Which magazine was founded by Pop Artist Andy Warhol? (Interview). Which resurgent vocalist scored a big hit with his signature song "My Way"? (Frank Sinatra). Which Brazilian soccer star scored his 1,000th goal? (Pele). Who left The Supremes commencing her solo singing career? (Diana Ross). Which ukulele strumming singer married Miss Vicki on Johnny Carson's "Tonight Show"? (Tiny Tim). See also our other 50 gifts.